Crewed yacht charter information for a Mediterranean or Caribbean luxury vacation. Charter yacht listings, yacht charter search engine, or call for expert assistance to find you the perfect charter yacht for your luxury vacation. A luxury yacht charter is the ultimate luxury vacation for the elite - privacy, intimacy and comfort with opulent accommodations, outstanding cuisine and lots of personal attention - a tropical paradise luxury vacation with warm, friendly people and beautiful vistas. Our luxury superyacht charter yachts provide all this, plus plenty of opportunities for activities such as snorkeling, hiking, biking, golf, tennis, sailing, sunning on the shores of picturesque Mediterranean or Caribbean beaches and some of the most spectacular diving in the world - making this a unique and very special luxury vacation. A private yacht charter by Luxury Yacht Source allows you to indulge in the luxury vacation of your dreams. 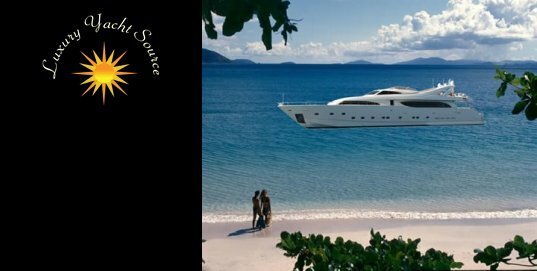 A luxury vacation yacht charter in the Caribbean, Mediterranean, Bahamas, New England, or Pacific offers you, the discriminating traveler, an exclusive, luxurious, private setting, with the superb excellence of sumptuous gourmet cuisine, superlative wines and Five Star service to which you are accustomed. Luxury Yacht Source offers over 1,000 luxury charter yachts for a luxury vacation the Caribbean, Mediterranean, Bahamas, New England, Pacific and many other exotic destinations. Our charter yachts range in size from 80 to 350 feet, and hold 2-to-200 guests. A luxury yacht vacation transcends even the privacy and luxury of the most exclusive hotel or villa. Our yacht specialists make it simple to select the perfect yacht to indulge your family, friends or colleagues. Our luxury charter yachts come with Captain, chef, stewardess and additional crew to cater to your every wish. Gourmet meals are lovingly prepared and the finest vintage wines are carefully hand selected according to your personal preference. A massage in the privacy of your charter yacht is always popular. Scuba diving may also be available by special request. On-shore luxury amenities are often available, such as tennis courts, restaurants, bars, nightclubs, as well as nearby golf courses, historic sites, art galleries, boutiques and casinos. Most of our Caribbean and Mediterranean yacht charters are located in luxury vacation areas that offer a great combination of nightlife, shopping, and outdoor activities. Luxury Yacht Source offers impeccably maintained luxury vacation charter yachts in the world's most famous luxury vacation resort areas - each a paradise on Earth. Sun, sea, and luxury travel - the recipe for a perfect luxury vacation. Our advantage lies in our personal care and dedication - and our knowledge of the yachts, crews and luxury vacation destinations - so that you get the best charter yacht luxury vacation suited to your style and requirements. Our team of yacht charter specialists has personally inspected most of the yachts in our fleet for the utmost in quality control - ensuring that your luxury vacation will go smoothly. Looking for that special something extra such as a difficult to get tee time at a world famous golf course? Luxury Yacht Source's Concierge can help you with anything to complete your luxury vacation of a lifetime. Experts in the industry - we can plan your complete yacht charter luxury vacation from finding the perfect yacht for you, to airfare, car charters, activities, concierge services, and first class service from tenured luxury vacation specialists. Just pack your bags - and enjoy your holiday - we'll take care of everything else! This is your moment and your much deserved luxury vacation is within your reach!